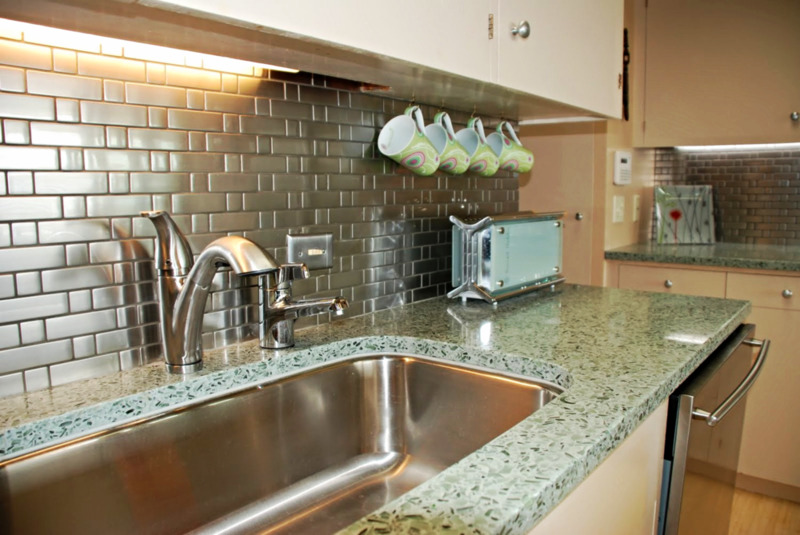 Vetrazzo Countertops – A Kaleidoscope of Color and Vibrancy with an Emphasis on Green. Countertops are like permanent furniture in your home – they embellish a room and help set the mood and ambience. If you are looking for something that is both beautiful and sustainable, Vetrazzo may be the perfect fit. This is one of the few surfaces out there that is eco-friendly, durable and manufactured in the U.S. – not to mention boasting a unique crushed glass mosaic look. Each Vetrazzo slab is comprised of 85 percent recycled glass making it one of the “greenest” countertops out there. In short: what started off as a bottle of wine enjoyed over a delicious dinner can eventually become part of the countertop you prepare your meals on. Vetrazzo countertops are a work of art – a kaleidoscope of colors molded into a perfectly polished countertop that infuses a room with color and panache. These countertops can instantly become a conversation piece because each slab has its own story to tell. For instance recycled beer bottles are used in the 'Alehouse Amber' slab and Skyy Vodka bottles used in the 'Cobalt Skyy' countertop. Vetrazzo countertops have a contemporary, eclectic style that you won’t see with other surfaces. It comes in variety of designs, and each slab has variations as the recycled glass used in the manufacturing process will vary in color and size, so your countertops will always be unique from any other. Skyy Vodka bottles about to be recycled into your new countertop! Each step in the month-long process to creating a Vetrazzo countertop is meticulously overseen so that the final product meets the highest in green standards for being environmentally friendly and sustainable, as well as ensuring product quality and style. Vetrazzo uses the glassware that is discarded in your recycling bin –whether it be bottles, jars, or other colored glass products. Once this myriad of glassware is brought to a recycling plant it is sorted and crushed, and may be sold to companies like Vetrazzo. From there Vetrazzo further sorts and separates the glass with an eye for unique colors and properties. The glass is further crushed and mixed with a cement compound which uses no hazardous chemicals, petroleum resins or additives, resulting in a surface that is completely non-toxic. The mixture is poured into large pans and baked. Then begins the process of careful polishing and making sure each slab is perfect and ready to be installed. While that’s the story for how Vetrazzo is manufactured, the real story for these countertops begins once it is installed in your home. After all, this is the surface you will do your living on. And this product can withstand whatever you throw at it. It’s as strong as granite and more heat resistant - up to 600 ºF. The amount of recycled glass used in the product makes it naturally stain resistant. Maintenance is minimal, just clean with soap and water, avoid harsh abrasives and seal every one to two years – or you can let the surface evolve with a patina that will develop over time. There is a 10-year limited warranty as well as a recycling program at the end of its life. Vetrazzo stands apart from other options for countertops on all fronts - its unique esthetic, its sustainability and green attributes as a recycled material, and its amazing durability. It is a product that will help showcase your home, but you will also leave you feeling good about your choice of materials.